Sacandaga Valley Arts Network (SVAN) announces the exhibition “Channeling Moses” Fracking Art by Linda Finch beginning December 29, 2017 and continuing through March 1, 2018 in the SVAN Gallery located in the Northville Public Library at 341 South 3rd Street. This visual diary illustrates the impact that some gas companies are having on rural New York State. Although horizontal fracking is banned (temporary moratorium), the business of gas extraction, transport, and storage are big business, and small villages, communities and their citizens make up part of the landscape that inhabit the same terrain as these energy sources. 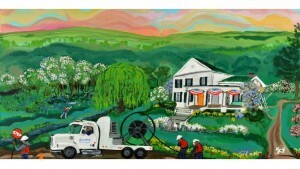 Ms. Finch began this series as inspired by Grandma Moses’s pictorial visions of life in rural New York and Vermont. “This style was perfect to tell the stories of the travesties that have befallen our farming and rural communities.” adds the artist. The show was first opened at the Bennington Museum in Vermont adjacent to the Moses gallery where it received excellent reviews. It was recently shown at The Fenimore Museum in Cooperstown where Otsego County is fighting their own battles with gas corporations and land infringement. Ms. Finch’s acrylic work in folk art genre tells of her own experience living in one such rural hamlet, that of Sullivanville in the Marcellus Shale region of the Finger Lakes. Although New York State purports to have a renewal energy plan, the state continues to allow these companies from Virginia, Texas, Ohio to access gas in or region and supports the build-up of fossil fuel infrastructure that can pollute our water, land and air. Some companies have recently turned their attention to the Utica Shale region, which includes Otsego, Oneida, Herkimer, Fulton, Montgomery, Schoharie County and others nearby. Linda (Lopuch) Finch was born in Gloversville N.Y. She received her B.S and M.S from the NY State University at New Paltz. She has additional degrees from Cornell University in Industrial Labor Relations and is retired from the New York State Education Department. Some of her work is in the permanent NYS collection. In addition to painting canvases Linda also paints murals and has several in homes in Florida and St Croix, US Virgin Islands. Growing up near the Cayadutta Creek in her home town made her acutely aware of the effects of pollution on both the natural environment and the health of the people in her neighborhood. In 2017 she moved to Northville N.Y., as her home in the Finger Lakes was no longer safe, due to a large industrial gas compression station built next to her residence. She is currently researching and executing a new collection of works that focuses on historic Sacandaga Park as it was in the early 1900s. Her interest in the area stems from summers spent “at camp” in the town of Northampton, as well as hearing stories from relatives and mother, Agnes Simonds Lopuch.